Another dry day was in the making. This part of the coast is now in the La niña cycle, though not chronic. It has been a while since really dry dust has been encountered roadside. Wandering off down to the beach a couple of hundred metres away. The place was a hive of activity. Smaller skiffs were returning from the nights fishing, many people were just chatting sitting on boats watching the day take shape. 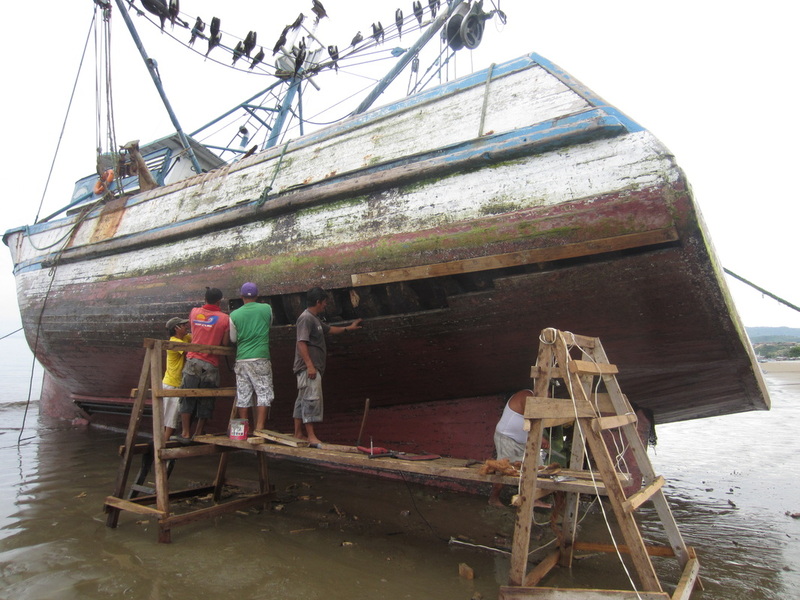 There was a large sardine trawler beached, at least 15 people were scraping the port side of the hull, the starboard side was pretty much resting on the sand. Just below the waterline on the topside portside, rot had impacted on the timber, a wooden scaffold was set up in the water that was receding with the outgoing tide. Another group of guys were on this, one person was using a large chainsaw to cut the rotting timber into sections between the stringers. Others were removing these sections with axes. The nails were then removed, measurements were taken. 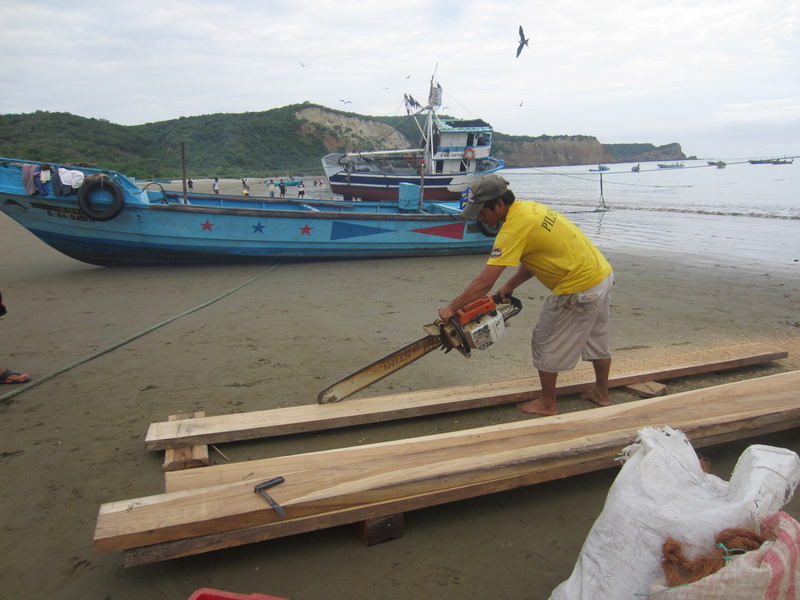 Further up the beach others were cutting a beautifully local coloured timber to replace the sections removed. 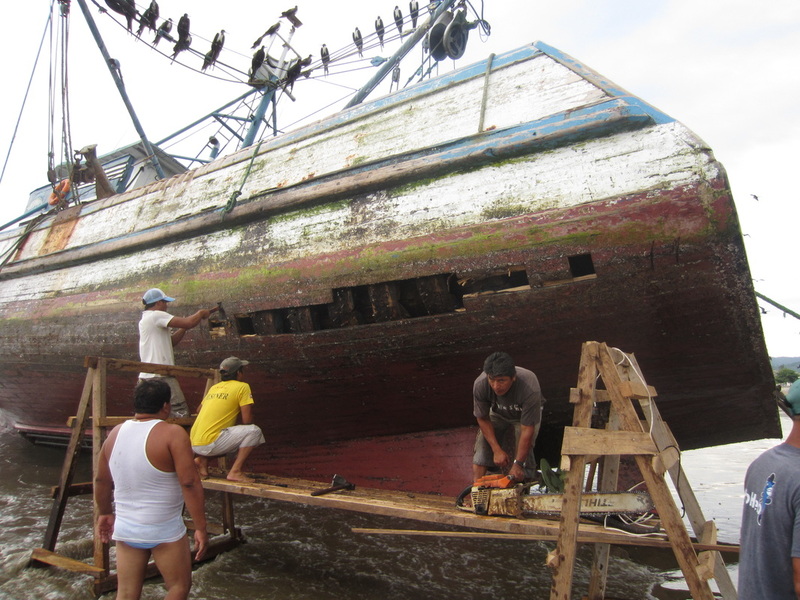 Others were replacing the caulking below the waterline with new coconut fibre. It was so intriguing watching this activity, the shipwrights were fascinatingly skilled at using very basic equipment. The timbers were cut with a large chainsaw, they fitted their new location absolutely perfectly. All the while others were scraping marine life of the bottom. These activities had to be performed in the time it took the tide to recede and return, it was by no means a small vessel. Back at the spot on the beach where the fisherman were carrying their catch up the beach in plastic tubs on their shoulders, the Frigate birds were having a field day. Some fisherman would send someone to accompany the porter to fend off the Frigates, others would cover the bins with a rag and run the gauntlet. The Frigates soon had the rag partly removed and were seizing the opportunity for a free meal. It was a spectacle to behold. These birds are huge, they fly with the skills of an acrobat and are always looking to steal morsals from each other. 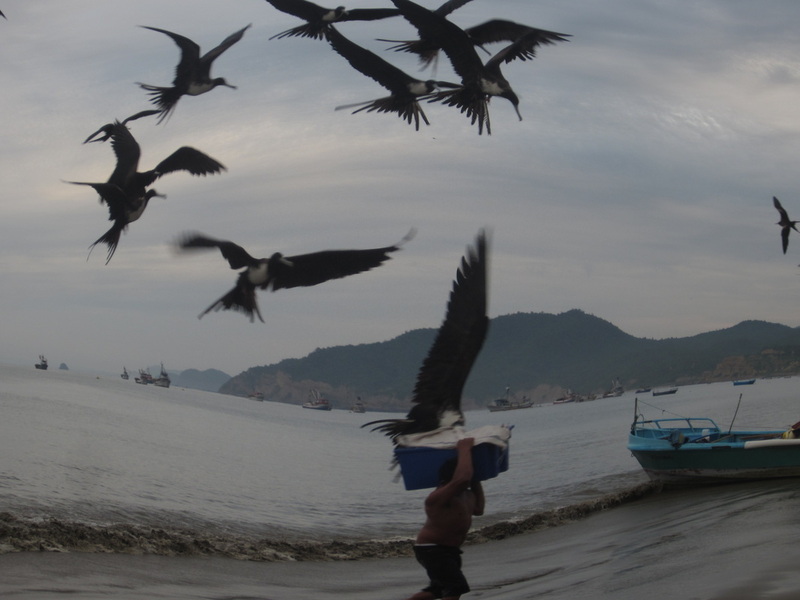 The fisherman seemed to allow this errant behavior from the birds, it was a lovely co existence. They move through the air silently, almost like diurnal bats. One would secure a fish, some, over 6 or 7 inches long, if he hadn’t swallowed it head first in a moment it was all on, the others were in for all it was worth. Though their antics never once did impede their ability to stay airborne. Being completely absorbed in all these proceedings, my stomach reminded me, it to wouldn’t mind some morsels, deposited therein fairly soon. Back up at the restaurant, grilled fish was enjoyed. 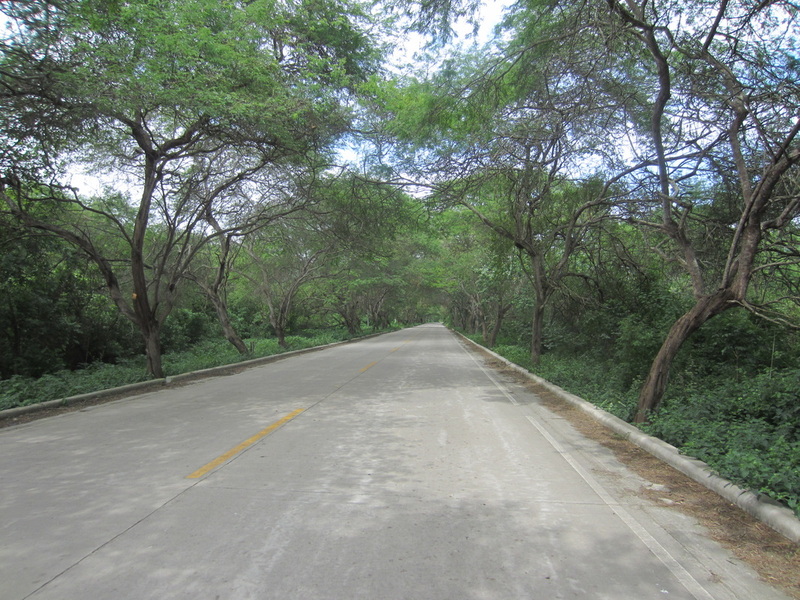 I packed the gear, said goodbye and lazily pedalled off for Puerto Lopez some 10km south. Arriving here, needing some kind of scarf to cover my ears from the sun, one was located, and purchased at a batik kind of shop. Chatting with some people, they told me of a good hostel. From here the Hostel Machalilla was booked. It had good internet, a kitchen, hot water and a good feel about it. Four nights were secured, Puerto Lopez was going to be my home for Semana Santa, here in Ecuador. The town is touristy but not over the top. It is more of a fishing village. The bay is littered with boats at anchor. The blog was updated, a reconnoitre of town was enjoyed, as were supplies from the local Tia supermarket. Dinner was enjoyed with locals in town away from the touristy beach bars. Back at the hostal a late night was really enjoyed chatting in the court yard with two Argentinean girls and an Israeli girl. It was great Spanish practice, fun and good company, both the Israeli girl and I were about the same level. Among other things it was a laugh discussing the ritual of putting used toilet paper in a waste bin in the bathroom, it becomes quite a habit. It is common place throughout Central and South America. Argentina is experiencing bad inflation right now, their currency is like the plague here. $US are the way to go down there. Going for it, both Frigates and the beach runner. These birds typify the skies here near the equator. The new plank fitted so snugly. 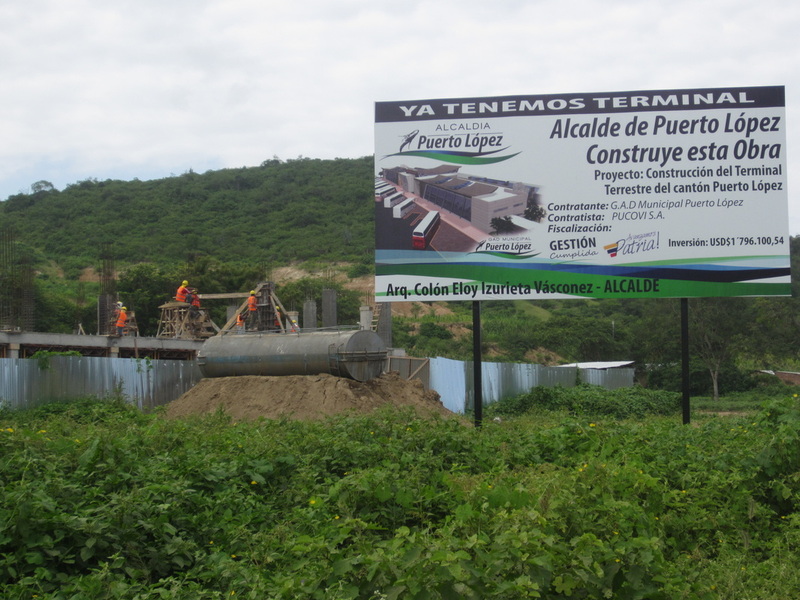 A new bus terminal for Puerto Lopez. Correas government is doing its best to keep the normal people here mobile at a reasonable cost. Owning a car is expensive, though the price of fuel somewhat offsets the statutory costs.